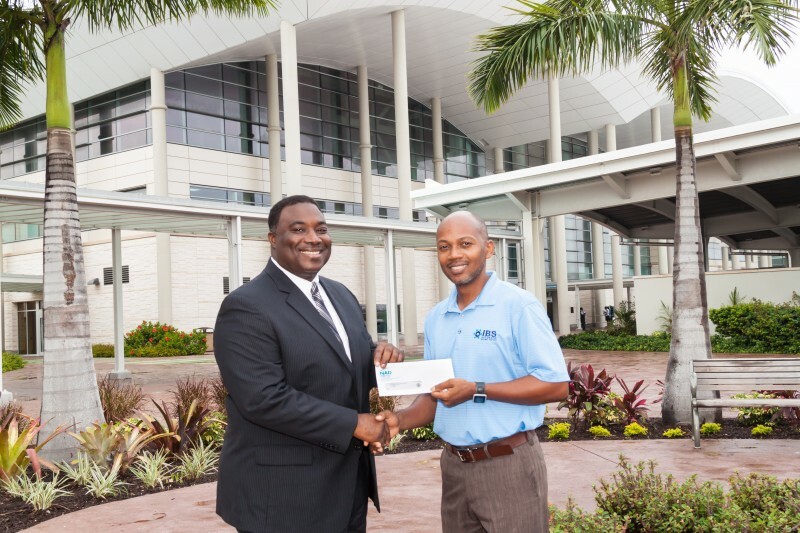 Nassau Airport Development (NAD) partnered with organizers of the 8th Annual IBS Build-A-Bridge Challenge, becoming a gold sponsor of the event. For Kevin McDonald (left), the company’s Vice President of Maintenance & Engineering, the chance to help future engineers seemed like a natural fit. “It’s an excellent opportunity for students with an interest in the applied sciences to take part in a fun and engaging exercise while learning about the field of engineering in the process. As a company, this is an initiative that we are proud to support.” The competition pits student teams from public and private schools against each other to successfully build miniature bridges. More than 100 kids, representing 20 schools take part in the program endorsed by the Ministry of Education, Ministry of Youth, Sports & Culture, Ministry of Works and The Bridge Authority. McDonald is pictures presented the donation to Kevin Sweeting, Director of Operations at Integrated Building Services, Ltd. (IBS), the organizers of the initiative.